Oriflame, the leading direct selling Swedish beauty brand, after completing two decades of providing unparalleled beauty products to the Indian market, announced its entry into the wellness segment to contribute to one of the most important element of life – well-being. I was elated to be a part of this rejuvenating event in the capital witnessing the launch of 3 supreme, high quality supplements and a holistic approach towards wellness. The event had a lot to offer from fitness booths to salad counters and what not. The panel of speakers included Mr. Niklas Frisk, Vice President & Head of South Asia and MD, Oriflame India, Ms. Sonia Narang, a renowned dietician & nutritionist who is all set to extend her expertise to add value to the brand’s efforts in health & wellness initiatives across the country. The wellness range was presented & launched by Mr. Akhil Kumar – Boxer, Arjuna Award winner, Olympian and Commonwealth Games medalist along with the Oriflame management. Akhil, the epitome of fitness and much acclaimed Indian boxer shared his insights into the relationship between being fit, the overall quality of life and happiness. The guy was downright honest & funny as he shared his journey on the stage. Wellness by oriflame product range comprises of Nutrishake and Nutrisoup in weight management category and Omega 3 capsules for every day health. The healthy Nutrishake comes in 3 delectable variants- Nutrishake Natural Vanilla flavor, Natural Mango-Banana flavor and Natural Strawberry flavor. Wellness by Oriflame also introduced Nutrisoup Tomato & Basil which is comprised of 100% natural ingredients & serve both the crucial needs of weight loss & health management. Wellness by Oriflame Omega 3 capsules are – a rich source of natural Omega 3 fatty acids that provide abundant health and beauty benefits derived from renewable stocks; the fish gelatine capsules are free from toxins & heavy metals and provide many benefits to the heart, skin and joints. Elaborating on the range, Malin Petersson, Wellness Manager, Oriflame India said, “Wellness by Oriflame combines the wisdom of nature with the best of Swedish science. The extra-ordinary range of products aims to provide 360 degree support to those seeking fitness – a nutrient-dense diet and improve the overall quality of life. intensive research aimed at improving the quality of life. 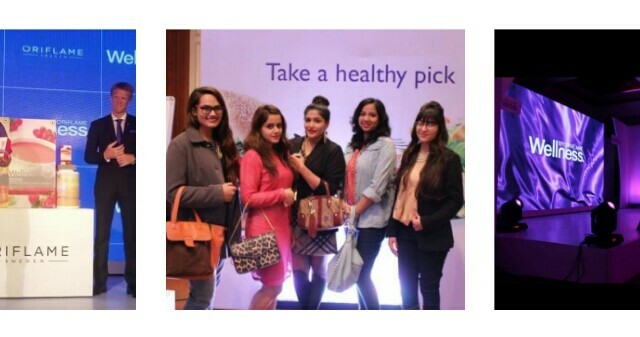 ” She also touched on the 4 cornerstones of Wellness by Oriflame- high quality supplements, adequate nutrition, exercise, taking care of one’s well-being and reaching out to wellness by Oriflame to discover a fitter, healthier, happier self. I totally agree that an unhealthy lifestyle, increased stress and unbalanced nutrition are causing a lot of problems today. We don’y pay attention but we are exhausting our bodies way more than we are investing in it. As our day unfolds we find ourselves tired with sloppy eyes and toxic thoughts. Now is the time to make conscious choices and be that change. With wellness products I believe we have the simplest and easy way to incorporate a healthy lifestyle that we can enjoy in different flavors. I will soon be bringing up the reviews of these products on the blog! Watch out this space for more! You can check more and be a part of this wellness movement here. Do follow this space for more!